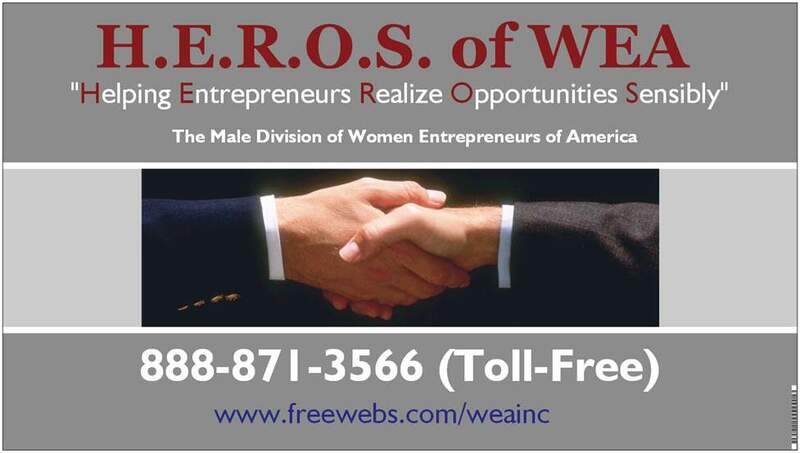 Women Entrepreneurs Of America Inc. - HEROS of WEA, Inc.
A Network/Mentoring Male Division of Women Entrepreneurs Of America, that brings CARING people with Business, Mentoring and Life skills together with the purpose of developing long term trusting relationships. the budget of any business. We strive to attract caring people who are willing to share and give back. from someone who has walked the walk and can talk the talk. The people we tend to attract to our women's organization are caring people who are willing to share of their knowledge and wisdom; they truly are "Mentors In Motion". For that reason, an Associate Male membership to our organization is by referral from one of our Associate Male member, by National Headquarters, members in good standing, one of our Sponsors, or Affiliates. You will meet positive caring business people with a wealth of business, mentoring and life skills. You will feel the synergy that happens when there is an interchange of encouragement and words of wisdom. Learn how to grow your business, set goals, and develop business and life skills in a safe and fun environment. HEROS National HERO Chairman, James Webb at 888-871-3566 for more information.